Maritime Developments’ flex-lay spread has concluded its latest project in the Atlantic. 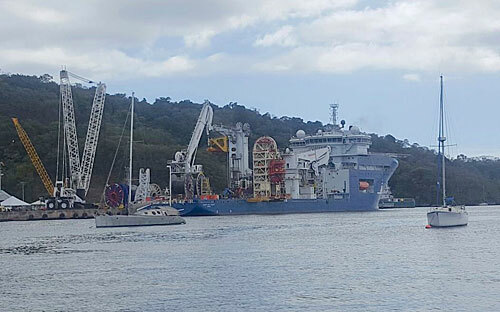 MDL’s 400-tonne reel drive system and patented 4-track tensioner – both forming part of the MDL Offshore Service fleet – were deployed alongside the company’s unique Portable Vertical Lay System (PVLS), as part of a flexible installation offshore Trinidad and Tobago. The system mobilised on board the North Sea Giant at the start of the year, before heading to the Caribbean for the 35-day campaign, which included numerous flexline and umbilical lays. Once the project concluded, the spread returned to Europe, where it was demobilised off the vessel in a 48-hour operation. All of the MDL systems forming part of the integrated spread feature unique safety solutions that reduce the risk to the product and personnel, while facilitating smoother handling and quicker turnaround between products and port calls – reducing the overall mission time and therefore costs. Thanks to their portable design, all of MDL equipment can travel by road in modules, and can be mixed-and-matched to form the most efficient horizontal or vertical spread for individual project requirements. This includes the most recent add-on to the MDL Offshore Service fleet, the 110-tonne 4-track tensioner, which has also returned to the Peterhead facility in modules, following its maiden project offshore India. The MDL TTS-4/310 was used to transition a small-diameter umbilical from the beach to seabed at 160m water depth. The project was completed ahead of schedule. “These two projects demonstrate the benefits of the complete MDL package – equipment and personnel – to global flex-lay operations, wherever in the world the next project might be taking place,” adds Gaskin.